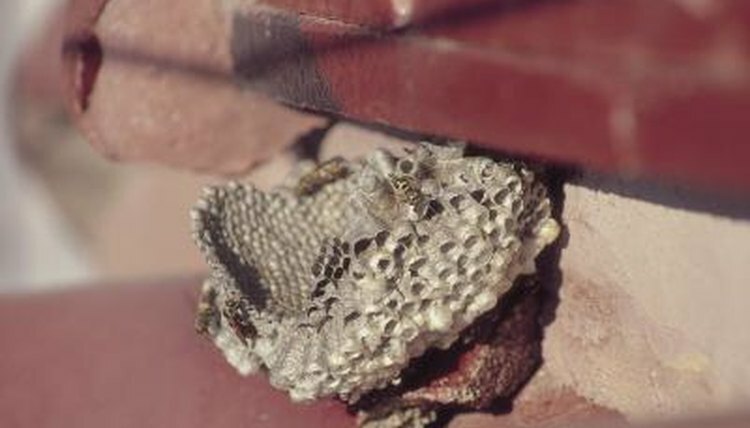 In climates where the temperature drops in the fall and winter, many of the wasps from a given colony die off. Their legacy lives on in the virgin queens, who leave the nest to become impregnated before finding shelter for winter. When winter ends and temperatures become hospitable again, these queens can lay their eggs and start building a new colony. Before temperatures drop enough to kill off a wasp colony's males and queen, the colony's females, or virgin queens, are impregnated. They can then go off on their own to find shelter and hibernate for the winter, while the colony they left behind dies. When they awaken in the spring, they start building new nests made of small cells, similar to a honeycomb. A queen lays one egg in each of the cells, and within 2 or 3 days, the eggs hatch. Once they do, she feeds the larvae insects that she has chewed up for them, and they mature inside their cells. After 12 to 18 days of this, the larvae encase themselves in their cells by spinning silk, and after about 12 more days, they come out fully grown.